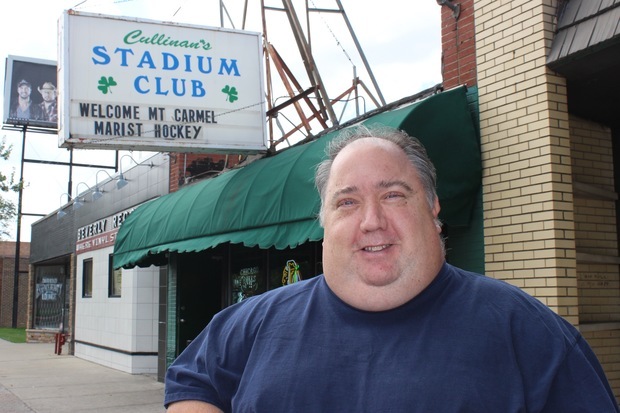 Dan Cullinan plans to change the name of the bar he's owned since 1989 to Cullinan's Center Ice. The name change will coincide with some modest upgrades aimed at drawing users of the Morgan Park Sports Center. MORGAN PARK — Cullinan's Stadium Club is getting a new name and new look in the hopes of attracting users of the nearby Morgan Park Sports Center. Dan Cullinan has owned the bar and grill at 11610 S. Western Ave. in Morgan Park since 1989. He believes some modest upgrades along with the new name, Cullinan's Center Ice, will give his business a much-needed boost. "We've been excited since they broke ground across the street," said Cullinan, a Beverly resident. "Things need a little shot in the arm again." He said business was slow this summer, but he's seen an uptick since the debut of the indoor ice rink and gymnastics center on Sept. 1. The 64,000-square-foot center is home ice for Mount Carmel High School, Marist High School and the St. Jude Knights Hockey Club. To truly capitalize on the $18 million project by the Chicago Park District, Cullinan feels he needs to change the perception of his bar and grill. He's been closely studying Buffalo Wild Wings and other businesses to do so. He hopes the renamed bar and grill can be rebranded as a place for families looking to grab lunch or dinner after hockey practice as well as a good spot for adult players to get a burger and bucket of beer after league play. "I'm that everything that they are looking for," said Cullinan, adding that his establishment draws mostly adults now. He'll add a children's menu with items such as hot dogs, mini-burgers and macaroni and cheese in the next couple of weeks. The new name of the bar and grill will be subtly added to the menu at that time. Cullinan hasn't ordered a new sign for the marquee just yet. Instead, he's hosting for a logo design contest for Center Ice. The winner will receive a $100 gift certificate. Entries can be submitted with the bartender, and Cullinan expects the new sign to be in place by Jan. 1. He's also hoping the sign will be advertised at the new rink, as well as on T-shirts and other promotional items. Cullinan plans to replace all the tables and chairs, too. This will allow Center Ice to better accommodate team outings and fundraisers. He's also considering other modest upgrades including a new color scheme and eventually replacing the black-and-white floor tiles with an ice rink-inspired design. The ceiling of the bar now is made to look like a football field. Cullinan plans to keep this signature feature, though he'll eventually incorporate a new paint scheme downplaying the Kelly green features. "You hate to lose the Irish look on the South Side," said Cullinan, who plans swap the shamrocks for Blackhawks logos along with the logos of the Chicago Police Department and the Chicago Fire Department. One thing that will remain is the half-pound burgers on the menu. These have become quite popular on Tuesdays and Thursdays when Stadium Club offers a buy-one, get-one deal. Cullinan will keep the deal going under the new name and hopes to build on the neighborhood favorite by adding some specialty burgers, including a burger topped with a fried egg and others. Stadium Club is now open from 11 a.m. to 2 a.m. Sundays-Fridays. The bar stays open until 3 a.m. on Saturday night. Cullinan said he wouldn't be against closing sooner if the new concept takes off, as he doubts many families will be coming in during the early morning hours. "It just needs a fresher look," he said.